Serapias ionica is with 5 to 20 cm rather short. The 4 to 8 linear-lanceolate leaves are green, in the upper part sometimes with a red hue. The stem carries 2 to 10 flowers with sepals and petals forming a helmet which is directed upwards or horizontally. 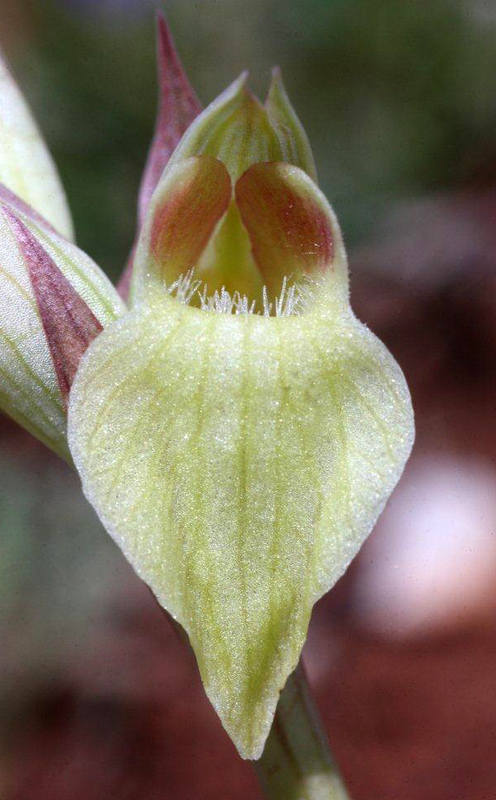 The labellum is broad, the lateral lobes projecting from the hood. The plant was first described by Helmut Baumann and Siegfried Künkele in 1988, the name was given by Erich Nelson. A synonym is Serapias neglecta ssp. ionica. The flowers are normally reddish to purple. Given the fact that these plants are quite rare, the albiflora form is even more rare. Serapias ionica can be found on dry grassland. Bloom is from March to April. The species can only be found on the Ionian islands and the Southern Dalmatian region.